Is this really such a radical approach to maintaining optimum tissue integrity? Tissue damage associated with patients being cared for ‘inbed’* have been historically called pressure or bed sores/ulcers, decubitus ulcers and other names. The latest term being used is pressure injury however, we believe a more accurate description is ‘force-related tissue damage’ (we’ll explain why in our research being published in March 2017) and so we will be using this term, tissue damage throughout this blog. Health or Social Care Professional do not intend for or want the patients in their care to develop any tissue damage. Yet, however well intentioned the currently accepted ‘inbed’ care practices and products are, patients are still suffering. Some patients are more prone and of a higher risk to tissue damage (for example due to spinal cord injury or are of older age). However, there are those patients who don’t fit into these categories that are also prone and are at risk to tissue damage when the body’s threshold of resistance and/or ability to recover from damage, is exceeded. •	External environment – a combination of any resting/support surface together with the way that any patient body mass** movement occurs on that surface. However, there is one major external factor in all tissue damage occurrences: that is, the patient is interfacing with a resting/support surface. The body protects and repairs its internal environment by using both physiological and biomechanical mechanisms (tensegrity) through a complex system of homoeostasis to maintain optimum tissue integrity. From our new research being published in March 2017, there are at least 22 factors that can contribute to the loss of optimum tissue integrity i.e. that can cause/contribute to both a reduction in the tissue resistance threshold and/or a reduction in tissue recovery. These include generic factors (such as stress), systematic factors, structural factors and local factors. 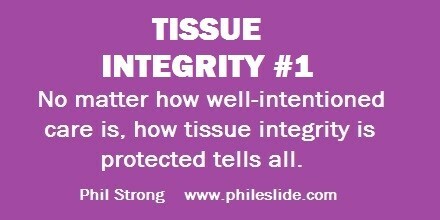 There are many ways external forces can compromise a patient’s ‘inbed’ tissue integrity. Unnecessary external forces can be generated by how the patient is rested, how they are moved and how they are re-stabilised, during and after their body mass has been re-orientated. These harmful forces are generated as a result of both inconsistent manual handling practices and the use of mechanical means that are working against gravity and trying to overcome the gravitational pull forces that are keeping the patient stable. re-orientated safely, further compliments and supports the body’s innate homeostasis to keep the patients skin and tissues within its natural threshold of resistance and repair. Thereby, maintaining its optimum tissue integrity. To initiate and during any movement or re-stabilisation of the patient’s body mass, the externally generated forces have an effect on the patient skin surface or deeper tissues and cells. This is because these movements are working against gravity in order to overcome gravitational pull, which is keeping the patients body mass stable on the resting/support surface. Movement can be both intentional and unintentional. Similarly, any movement can be gross or micro movement. Some of the patients’ movements can be made by themselves. Other movements can be initiated by their carers either manually (manual handling) or using mechanical aids. Due to the complexities of the body’s internal systems for preventing and repairing tissue damage, it therefore stands to reason that most effective trajectory to maintain optimum tissue integrity is to control the major factor within the external environment – i.e. the resting/support surface as well as the interface and ways of movement. It is WITHIN OUR CONTROL. •	requiring the products/practices to work with gravity, rather than against it. All the currently accepted moving and handling practices rely on carer behaviour (administrative- lower level hierarchy risk control) These practices and products use training and compliance as a strategy to prevent the patients’ skin integrity from failing. Charles Jennings in his article, “Compliance training: does it really work?” observes that frequently, compliance training is a defence strategy that occasionally works, but increasingly doesn’t because of difficulty controlling carers behaviour (for example due to conscious and subconscious behavioural drift). Therefore, designing out (higher-level hierarchy risk control) unsafe practice, unsuitable products and reliance on monitoring compliance, and designing in a safer care trajectory is necessary. By taking this safer, combined ergonomic and biomechanical approach, the risks to both carers and patients associated with ‘inbed’ care and positioning can be removed. •	Patients need a safe environment (social or hospital) to enhance their care. •	Whilst being cared for ‘inbed’, they need to avoid tissue damage. •	They require effective infection control that prevents them contracting other infections whilst receiving their care. •	They need to be at an optimum temperature. •	Nurses and carers need products that are intuitive and easy to use, and are compliant with safe patient care expectations and regulation. The good news is that technology does exist to design out unsafe practice and designs in safer care, and the Biotechsis Inbed Care Management System is a leading example of this. •	Forces of abnormal magnitude, angle and/or time are prevented for occurring. •	The correct synergetic layers between the patient’s skin and their resting/support surface prevents any friction on the patient’s skin. •	Any patient movement is working with gravity and is at a speed and angle that allows the body’s innate protection mechanism of homeostasis and tensegrity to maintain optimum tissue integrity. We should not work on, to err is human; forgiveness, divine approach. No patient should experience ‘inbed’ “force-related tissue damage as it can be prevented. Anticipatory design is essential for ‘inbed’ care management products and safe patient practices. It provides an effective alternative to manually handling people in bed and uses technology to move patients safely. This approach does not compromise their skin and tissue thresholds of resistance and repair. Therefore, it eliminates the risk of skin and tissue damage to patients whilst being cared for ‘inbed’. by “inbed” we mean: Any resting /support surface facility which enables the patient to receive care, support and movement. This can include for example: beds (domestic/clinical), theatre tables, theatre trolleys, gurneys and X-ray tables, chairs and wheelchairs. Although this list is not exhaustive.